Our real-time chat room is free, professional and is an excellent source for traders to post real-time basic WRB Analysis, real-time trades or talk about other trading related topics as a public trade journal (diary). Also, the free chat room is well moderated (to keep the peace between members). Note: Moderator means exactly what a moderator is at a typical forum...he/she moderates forum/chat discussions and removes/kicks out spammers, trolls and trouble makers. A moderator does not mean "head trader". As stated, I keep the peace in the chat room and I manage the chat room. The purpose of the free chat room is for you to use it as your trade journal although we highly recommend you use the free chat room in combo with a professional trade journal software like tradebench.com, edgewonk.com, tradervue.com, tradingdiarypro.com, stocktickr.com, journalsqrd.com, tradingdiary.pro, mxprofit.com or trademetria.com because these professional trade journal software will do the quantitative statistical analysis for you involving your trade performance so that you can determine on your own the strengths & weakness about your trading. Later, if you want to, you can then post your statistical analysis in your private thread for your eyes only in reviewing your trade results as you traverse from one trading day to the next trading day. Note: The questions you answered in the registration process is not your trader profile. In contrast, your trader profile is an actual message post that you must post at the above link just like every one else. Also, do not post the below explained DOKs at the above trader profile link. Step 3 - You must download the WRB Analysis free study guide and then learn its basic tutorial chapters 1, 2 and 3 because ##TheStrategyLab chat room is only for traders learning/applying WRB Analysis. Simply, you must learn basic concepts of WRB Analysis so that you can identify WRB intervals, WRB Hidden GAP intervals, WRB Zones, Contracting Volatility, Volatility Breakouts, Reaction Highs/Lows, Key Market Events and Profit Targets. Just as importantly, you'll be able to understand the conversation in the chat room when the above key concepts are mentioned as they occur in real-time price action without needing someone to explain/define the terminology to you. Step 4 - You must demonstrate your knowledge (a.k.a. DOK) to show me that you understand the basic concepts from the WRB Analysis free study guide involving WRB intervals, WRB Hidden GAP intervals, Contracting Volatility, Volatility Breakouts and Profit Targets. If your DOKs are missing any of the mentioned key concepts...you will not be allowed access to ##TheStrategyLab free chat room...no exceptions. The DOKs will ensure that you have a basic understanding of WRB Analysis and ensure you understand any conversations in the chat room involving WRBs, WRB Hidden GAPs, Contracting Volatility, Volatility Breakouts or WRB profit targets. Further, the DOKs will help prevent drive-by curiosity seekers that want access to the chat room while having no real intentions of learning/applying WRB Analysis along with ensuring traders didn't join the chat room in an attempt to use it as a signal calling chat room. ##TheStrategyLab chat room is not a signal calling chat room. In contrast, it is your trade journal of WRB Analysis or trades and members will only help you with your WRB Analysis if you ask questions. To post your DOK, click on the New Topic button @ http://www.thestrategylab.com/tsl/forum/viewforum.php?f=61 and below you'll see a few DOK examples by other traders. Note: Do not click on the Post Reply button while reading someone's DOK to prevent your DOK from being posted as a reply to someone's else DOK. Post a DOK chart with annotations of WRB intervals and WRB Hidden GAP intervals as described in tutorial chapter 1. Post a DOK chart with annotations of WRB profit target 1 and WRB Hidden GAP profit target 1 or WRB Zone profit target 1 as described in the trade management section of the free study guide. You can use your own trade signal with WRB Analysis profit targets. If you do not have a trade signal, you must then pretend any price area on your chart was a trade signal for the purpose of annotating the price action afterwards with WRB pt1 and WRB Hidden GAP pt1 or WRB Zone pt1. Note: You must show in the chart the location of your trade signal (Long or Short signal) that's correlated with the WRB Analysis profit targets that you show on your charts. Yet, you do not need to explain the trade signal. Yet, if you're having problems with understanding or identifying WRB intervals, WRB Hidden GAP intervals or WRB profit targets via the definitions in the free study guide...post your questions here at the forum. Step 5 - Post an image of your monitor showing your most recent timestamp trade fills (simulator or real money) in your broker trade execution platform with your charts (exactly as it looked on your monitor when you were trading with your charts). Thus, we must be able to see the broker trade execution platform with some executed trades, timestamp trade fills and your charts...simulator or real money. 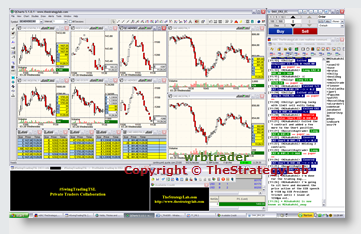 Click on below the screenshot image of TheStrategyLab's wrbtrader to see an example of one of his monitors from a multiple monitor trader workstation...the image is of the main center monitor that contains a chart, broker trade execution platform and recent trade fills (timestamp) in the broker trade execution platform. If you don't want other members or guest visitors to see your images...please send an email to us to request us to setup a private thread for you to upload the images. We'll never share that image and never share any content from your private thread with anyone for security & privacy reasons involving your private thread...no exceptions. These images of timestamp trade fills (simulator or real money) will be again asked of your recent trade activity if you decide to purchase our Advance WRB Analysis Tutorial Chapters. Simply, it lets you know you will need to post the information to qualify for purchase and its verification the TheStrategyLab only works with traders serious about learning WRB Analysis...not drive by curiousity seekers. Note: Please blacken out any private/confidential information in your images for security & privacy reasons. The above screenshot images are exactly what you should be posting regardless if you're on simulator trading or real money trading...no exceptions...no driveby curiousity seekers. In addition, in the same email...you must confirm you have read, understood and agree to the below participation rules...agreeing the you will participate in the chat room via talking about the price action on your charts involving either WRB intervals, WRB Hidden GAP intervals, key market events, contracting volatility, volatility spikes, volatility breakouts, swing point price actions, strong continuation price actions, WRB Zone analysis, WRB profit targets, WRB Hidden GAP profit targets, reaction highs/lows, trade management, breaking market news, general market news, market context or real-time trades (simulator or real-money) involving the price action you're watching. Our free chat room is for you to use as a trade journal of your thoughts via WRB Analysis from one trade to your next trade so that it provides the missing information you will not find in your broker statements alone. Traders that log in and then lurk (don't participate...don't talk) consistently will eventually be removed (KICK or BANNED) without exception from the chat room because these types of traders bring down the quality of the chat room and/or attempting to use the chat room for other reasons that its not designed (e.g. signal calling alert trade room). Simply, the chat room is only useful if you participate and use it as designed...as a personal journal of your WRB Analysis thoughts or trades in combo with your broker profit/loss statements so that you can add another piece of the puzzle to successful trading. Free chat room and the chat room is only for traders learning/applying WRB Analysis in their trading. The chat room primary purpose is to be your journal of your thoughts about the price action you're trading and/or real-time trades being posted by you (your choice of which to do when you use the chat room). Further, your participation in the chat room will help you with your trading via providing critical feedback about how you interact with the markets…something you can not get from your broker statements all by themselves because all chat room conversation is stored in archives for you to review any time you want. Therefore, do not log-in and then be silent because you'll be giving nothing back to the chat room as a useful collaboration resource and you'll failed yourself in revealing your thoughts on any particular trading day while you were trading. ##TheStrategyLab chat room is not a signal calling trade room nor is it a live trading room with a head trader telling you what to trade, when to buy and when to sell. We do not have the time/energy/resources to operate ##TheStrategyLab as a signal calling trade room and we do not offer those types of services. We only use the chat room to post our trades for transparency, for our own trade journal (diary) documentation of your own trades and to moderate (keep the peace between members) along with removing any user causing problems for other users of the chat room. ##TheStrategyLab is not mentoring in the chat room as in teaching others how to trade. In fact, we do not believe a trader can be mentored into a successful trader via an online chat room, live trading room or whatever you want to call it because we strongly believe that mentoring can only successfully be done via in person mentoring...teacher and student sitting side by side in the students home office or the student sitting side by side with the teacher in the teacher's home office via trading a real money trading account. This will allow the mentor to see personally other variables that's causing a trader to not become profitable that may or may not have anything to do with trading...variables that traders commonly hide from mentors in online mentoring. If/when you do log-in to ##TheStrategyLab chat room, you’re required to post at least one price action commentary involving WRB Analysis or one real-time trade (simulator or real money) per day you use the chat room. Forex EURUSD just produced a WRB Hidden GAP at 9am est on the hourly chart. Emini ES futures testing the R area of the most recent WRB Hidden GAP on the 5min chart. Contracting volatility in Light Crude Oil CL futures on the 15min chart. Is that a WRB Hidden GAP in Emini TF futures on the 3min chart @ 1145am est ? Gold GC futures volatility spike in reaction to the ECB speech. Low volatility tight trading range today so far in Forex GBPJPY. Trade in Eurex DAX futures just reached a WRB profit target. Also, if you’re going to ask someone questions about an open trade, ask your questions after the person has posted a trade exit or whenever you see the trader talking in the chat room during their open trade. In addition, type his/her user name in your question to ensure the trader knows you’re talking to him/her. If you're not able to access the chat room after having been using the chat room, please revisit the password thread here at the forum to get the new password because you're most likely still using the old password that's no longer valid. Yet, if you think posting real-time WRB Analysis or real-time trades is a distraction for you in the chat room, please post your end of the day commentaries at the TSL Support Forum or within any thread you think is suitable for your WRB Analysis commentary @ http://www.thestrategylab.com/tsl/forum/ to prevent us from thinking you’re LURKING (not participating).